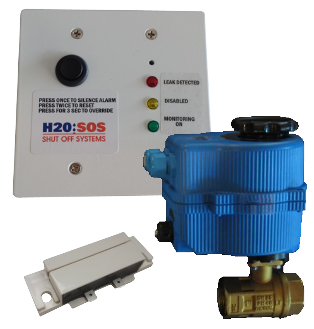 We are pleased to offer automated water leak detection systems from H2O SOS and FloodStopper. Unlike most competitors' systems, our leak detection systems not only provide an audible alarm when a leak is detected, but they also automatically shut the water off to prevent damage. From the moment a leak is detected by one of the system's sensors, the valve closes and the water is shut-off. A wide range of packages are available to suit almost every residential and commercial leak detection application; additionally, we provide the option to build your own custom system. Our standard shut-off valve inlet/outlet sizes range from 3/4" to 2". Both hard wired and wireless systems are available. Water leak detection systems with automatic water shut-off valves for residential and commercial applications. Valve sizes from 3/4 to 2 inches. Hard wired and wireless packages available.